Just text today- no photos. Today is Thanksgiving, and I will make the prerequisite giving thanks post. First off, I am thankful to be alive. In April 2013, I came about 5 minutes - literally- away from dying. Turns out I have diabetes, and didn't know it. It turned into Keto Acidosis. Learning to treat it has been a whole new experience, and not without some significant frustration, but I know that if I keep at it, it will not kill me. I have two relatives in their 80s who have had it for decades, and they are just fine, because they treat it, and don't say "Close enough". They are a big inspiration to me. I'm thankful for my Mom and Brother. I don't know what I would do without them. It's been a rough year for my mom in particular. I'm thankful for my hobby. 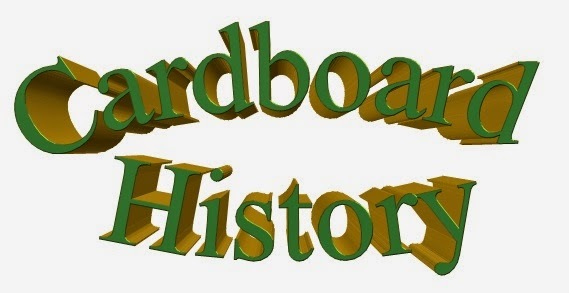 Hobbies, I have many, but cards, the subject of this blog, is my favorite. When I am in pain, or when I am worried, focusing on my cards gets my mind off it. I live in pain 24/7, by the way. I am sometimes able to be distracted from it for a short time, but it's always there, underlying everything else. My health is not all that great, as if you couldn't tell. After I lost my dad in 2002, I attempted to drown my sorrows in a sea of cards, and in 2014, as I worried about my mom being in the hospital for so long, I concentrated on scanning those very same cards to keep my mind from worrying too much. Or at least, attempting to- to varying degrees of success. 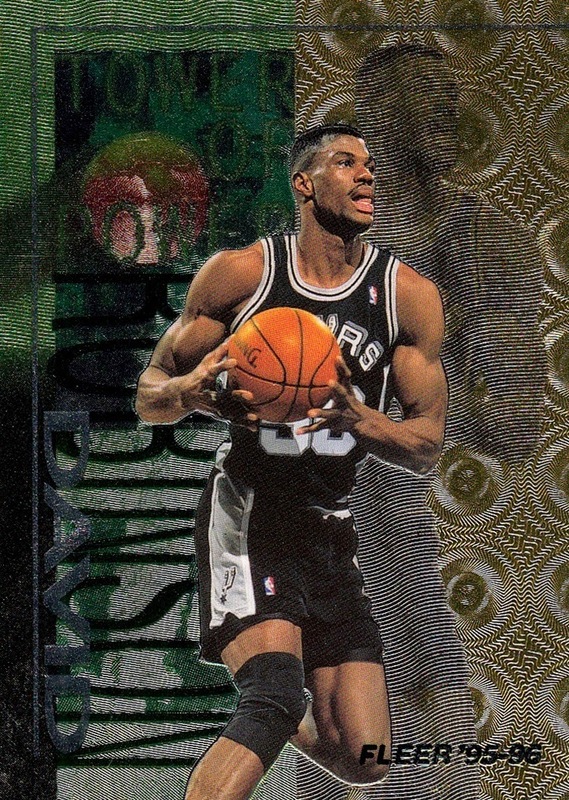 I am thankful for The Trading Card Database. 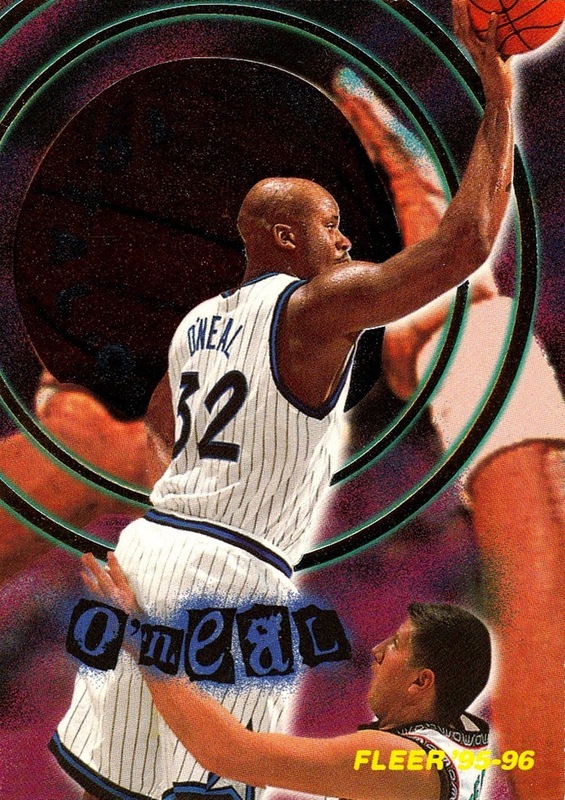 Focusing on getting my cards scanned and posted has been a big help, and it's a lot of fun, to boot. I also love the fact that they tell you automatically how many cards you have and the percentage for each set. Information I always wondered about but didn't have the wherewithal to figure out myself. I am currently entering in my tradelist, hopefully I will be able to convert some of my duplicates into cards I need. I am thankful for each and every card I get. I don't get as many as I used to, or as I'd like to, (I don't want to sound greedy, but to be honest, I am addicted to cards!) but I love to get new ones, regardless of who it is or what set it is. Every card has a place in my collection. I am thankful to get any of the cards I get. I know there are a lot of people who can't collect but would like to, and sometimes I can't either, as I have to spend more than $500 a month on medicine, it sometimes leaves me nothing for cards...medicine has to come first. So I am thankful for the opportunity to collect. I know there is a lot more important things in life than collecting cards, but it keeps me sane, LOL. As always, thanks for reading, and please enjoy your day! Set Profile: 1940 Gum, Inc. Superman. Or is it 1941? I'll be honest, while cards are my favorite hobby, they were not my first hobby. That goes to comic books- my brother read me my first comic when I was 5 days old, and I've never stopped. That's 30 years of reading comics (or, in those early days, having them read to me). I am primarily a DC reader, but I did not follow into the "New 52"...but that's a whole other topic that does not really impact this topic at all. This set is one that I always wanted; I don't know a whole lot about it. In fact, I didn't even know who produced it for many years. I just knew there was a Superman set issued in the Golden Age. (DC's Golden Age is 1935-55). Superman, who is of course the first superhero, was introduced in 1938's Action Comics #1, and this set was issued in 1940- or perhaps 1941. The cards themselves say 1940, but most sources say 1941. I don't know which is accurate, and would welcome clarification. It is not unheard of to prepare (and copyright) a set in one year and issue it in the next. I was surprised when I finally got some of these that they are original; I expected them to be pastes from comic stories, but they are not! A pleasant surprise. 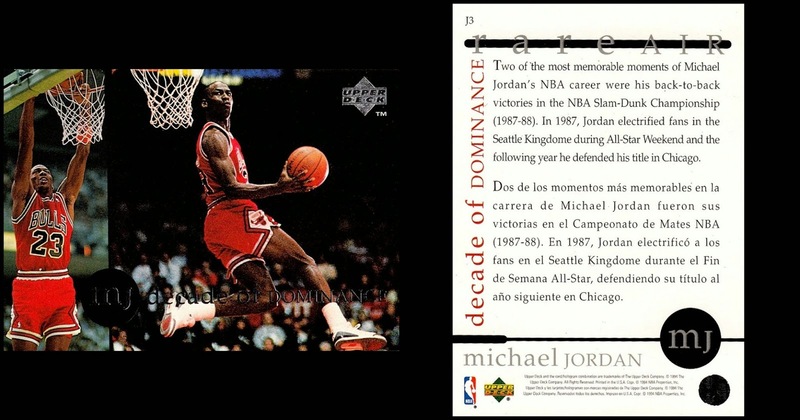 Interestingly, the backs of the cards state the copyright owner as Superman, Inc. I do not know why this is the case, as what is now known as DC Comics was then known as National Periodical Publications. Another mystery of this set. There were 72 cards issued in the set, and, as far as I know, there would not be another DC Comics related set until 1966...but my knowledge base of non-sports cards is not anywhere near as high as it is for the NBA or NASCAR. 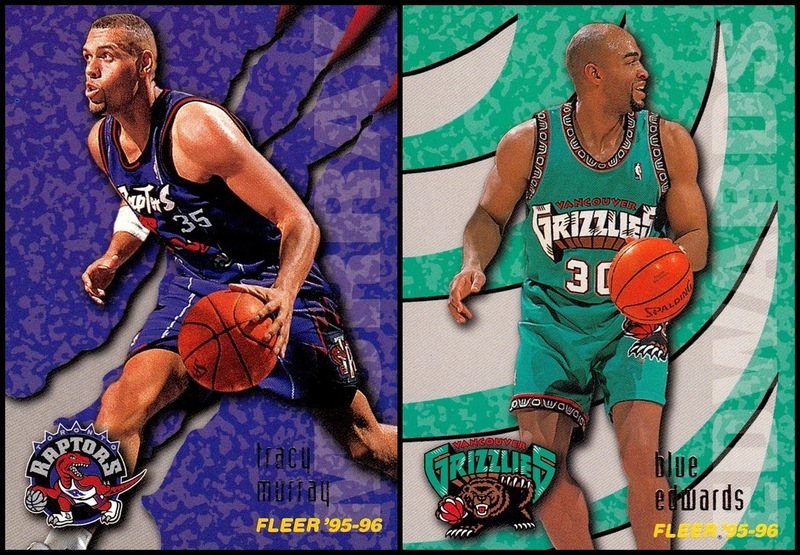 I only have three of the cards from the set, shown below. 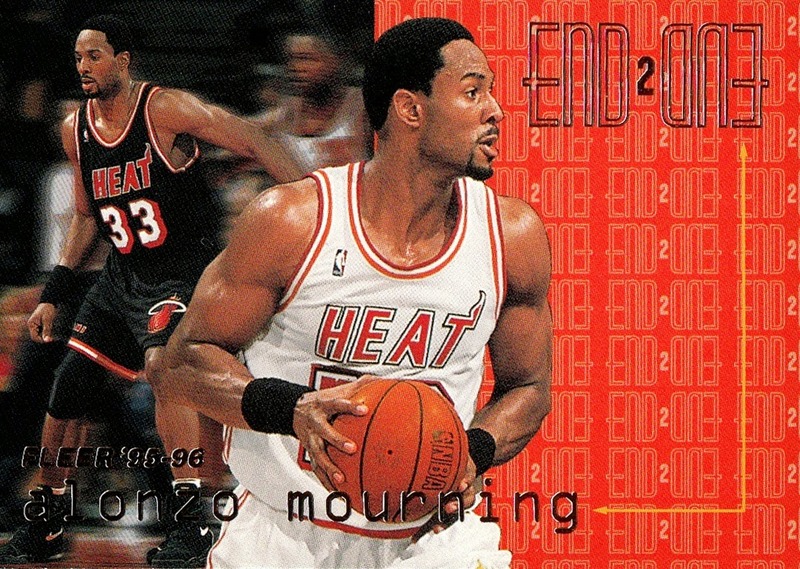 This was the first card in the set I added to my collection. (All three were added the same day, September 28th, 2014). I sure would not mind having some of those prizes mentioned in the Supermen of America Club on the back! I almost did not get this last card- it's in rather poor shape, with several creases. But, I knew I would regret it if I walked away without it. So, I didn't! Mail Day, a Clamshell and 2 packs- Cardboard History's First Ever New Addition Update! I may not be able to bring in new cards like I once did, but I still get as many as I can (of course, we all do that, right?) and I have gotten all these cards since I started Cardboard History- in fact, I was in the middle of typing up the Welcome Message when the first batch arrived to me. 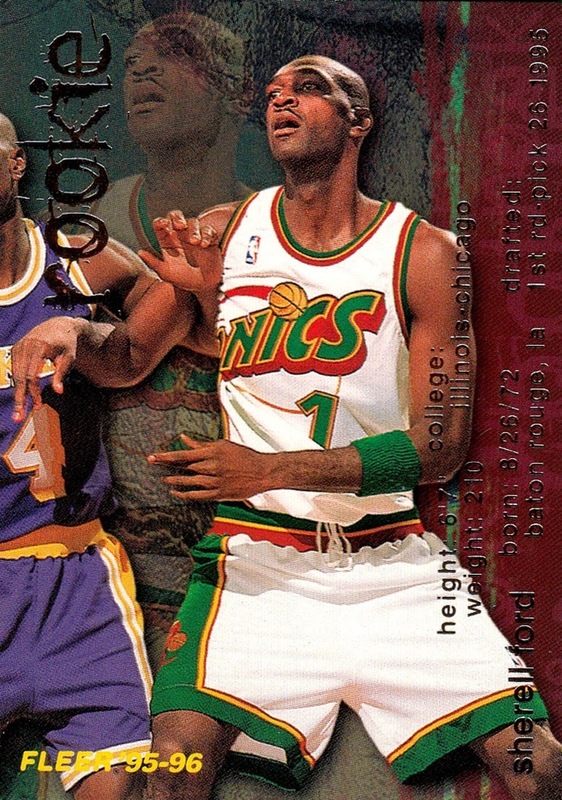 It took me a couple days to scan everything, and during that time, my brother surprised me with a clamshell of NBA cards, and two packs of 2014-15 Prestige. The Mail Day was a good one- I had purchased a lot of 31 NASCAR cards off an acquaintance on Facebook, and 30 of them are numbered. There were also some cards from 2013 Showcase as well. 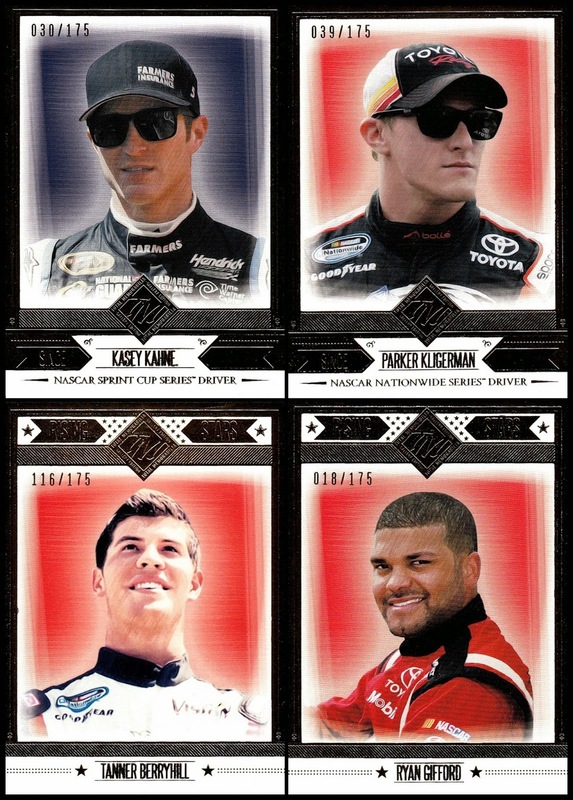 Note that the Clint Bowyer is one of the purple parallels numbered to 13. There were four gold parallels from 2014 Total Memorabilia, two of which were new people for my collection- Tanner Berryhill and Ryan Gifford. As you'll see in future posts, getting a new person for my collection is something I particularly enjoy- my goal is to have everyone who has had a card issued in my collection. One of my goals anyway! Unfortunately, gold foil generally does not scan well, and appears black. It's not. The horizontally based cards don't combine well with the others, so they are here. I now have two of the 10 Showroom cards from 2013 Showcase. I am seriously thinking about trying to complete the set. I don't chase inserts very often, but I really like this one. And finally, the color proofs. I am not a huge fan of these. I will still chase them (I AM an OCD completest, after all!) but they aren't my favorites. They also do pink, which are common (and hideous) and yellow, which are the hardest to find, and I don't have a single one in my collection. There is one more card that I combined with the clamshell cards. Coming up later. There were also two cards out of the lot that I really, really like. 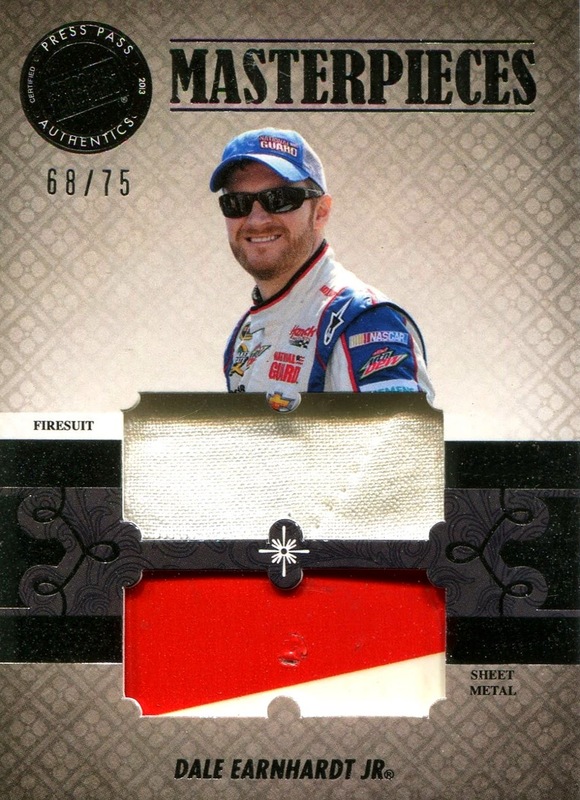 First up, is one of the Showcase parallels, and I didn't even realize it when I was looking at the lot, it's a Red, serially numbered 9 of 10, of Bobby Labonte. 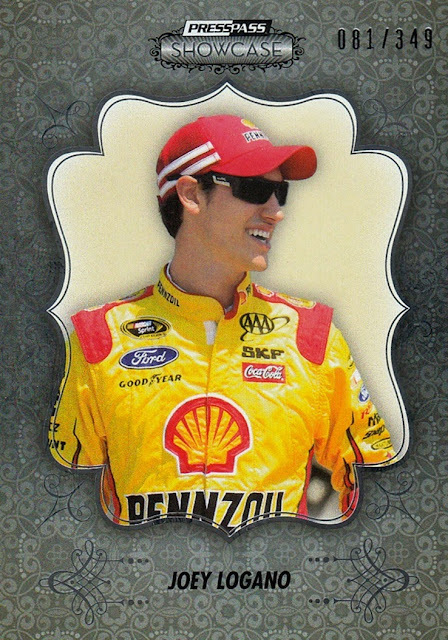 This is my second Bobby Labonte card numbered to 10. And this one. I am not sure which of these two cards I am posting individually are my favorite from the lot. It's hard to argue against a card numbered to 10...but this one makes a strong case! 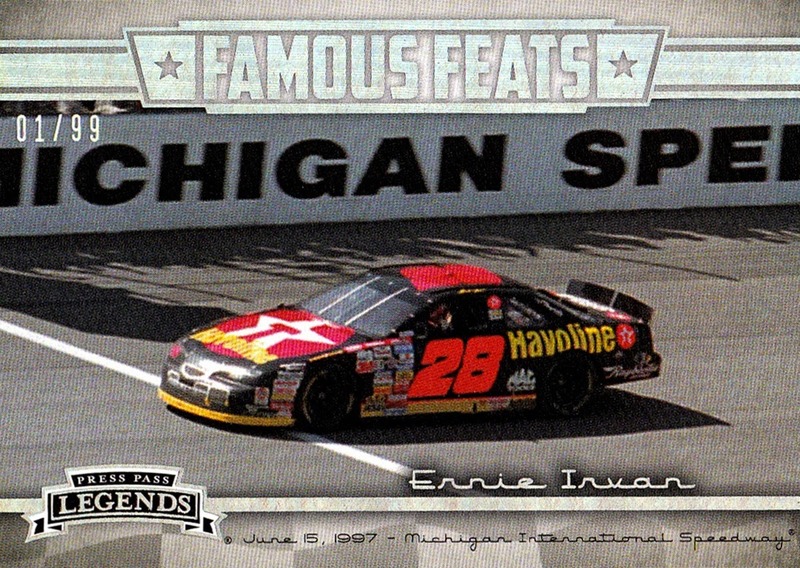 2013 Legends Famous Feats Holofoil #FF7, Ernie Irvan's car, serially numbered 01/99. Ernie was my favorite driver until he retired, and remains tied as my favorite. And it's serially numbered 1, something I always have enjoyed getting. I didn't notice it was 01 when I bought it. Yesterday, my brother took a trip to Target, and he brought me back some cards. A pleasant and fun surprise. He got me two packs of 2014-15 Prestige, and in one of them I pulled a Bonus Shots Purple card of Shabazz Napier, SN 46/49. 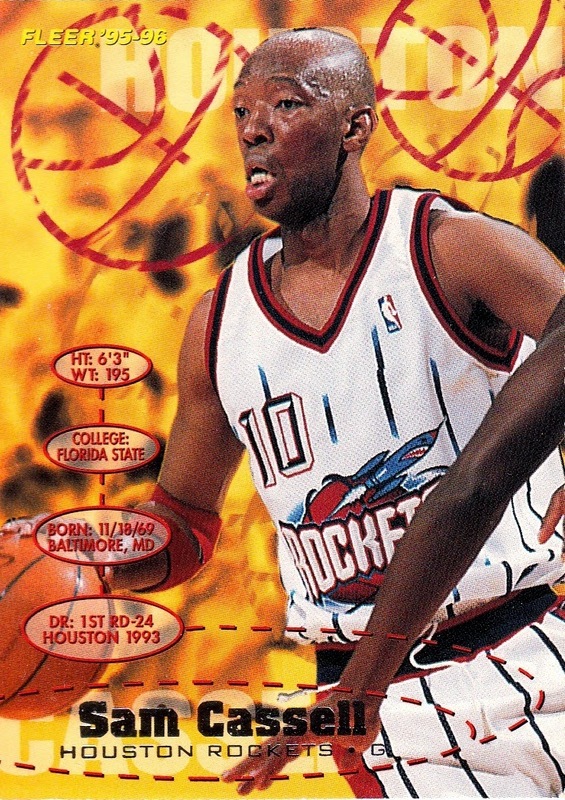 Every year it seems like there is one or two rookies that I get more cards of proportionally than other rookies, and it looks like Napier is going to be that one for this year- it's already my 4th card of him, and the year is only two sets out, for me anyway. It's on the bottom right. Then there's the clamshell. They are a proverbial crapshoot, because you never know what you are going to find in them. Most of the time, they are more often that not duplicates, which, when you have as many cards as I do, can only be expected I suppose. But occasionally they will be one that yields 20 or more new cards. Sadly, this was not one of them. The majority of the cards in this one were duplicates. This one yielded only 7 new cards. It's not the least new I've gotten out of one of them (that "record" is 3). But the cards it added to my collection are all good ones! 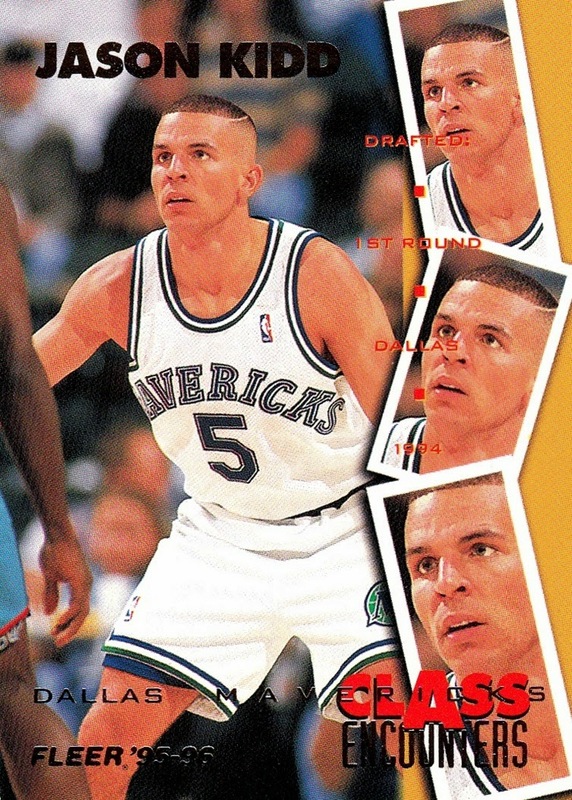 The 1991-92 Upper Deck card, Doug West, was a surprise. I am glad I checked, because I had assumed it was a duplicate- I was 13 cards away from the complete, 500 card set, and this was one of them! I now have 488 of 500, or 97.6% of the cards, according to the Trading Card Database. 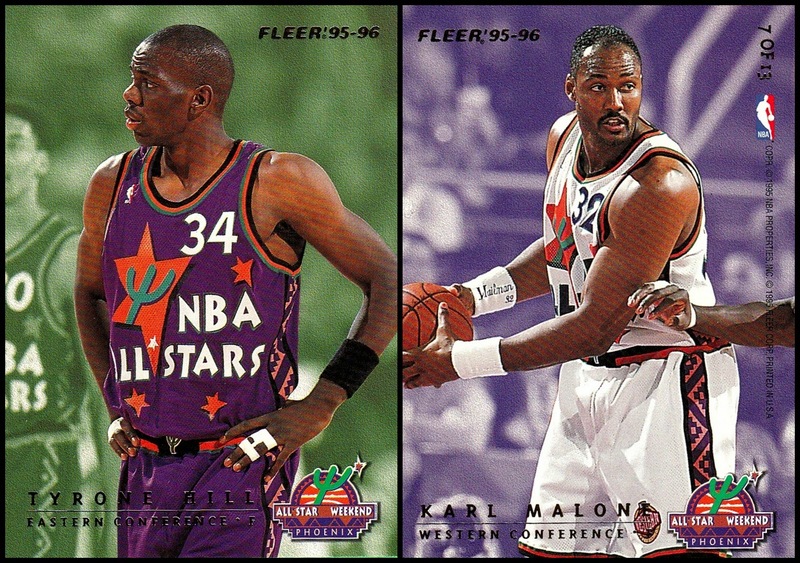 I'm not as close on the 1994-95 Ultra set. The Marty Conlon card here is my 264th of 350, or 75.4%. I'm not really a fan of college cards, but this one is new. The design is fine, but I am really only interested in pro cards- almost all of my college collection has arrived to me through the mixed groups (like this clamshell) that is my preferred method of adding new cards to my collection. 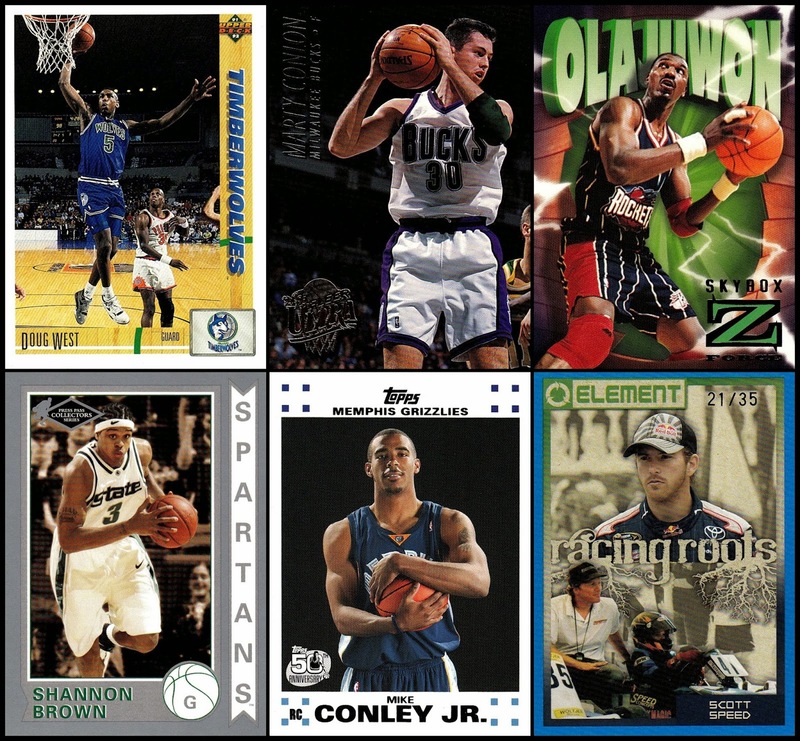 The 2007-08 Topps Rookie Set card of Mike Conley is getting me closer to this set. I now have 7 of the 14 cards (50%, that percentage I could do in my head!) and every one of them came from various clamshells or other mixed groups via my local Target. Finally, there were two other new cards in my clamshell. This one was on the outside of the package, and I had thought it was a duplicate, until I got it open and realized this is actually one of the Spanish issues. That means it's a new card, and it's the second time in 2014 I believed it was a duplicate until I saw it was bilingual. I have the complete Rare Air set (factory set) but I believe the International versions were issued as inserts in Collector's Choice- not standalone- although I am not sure on that. 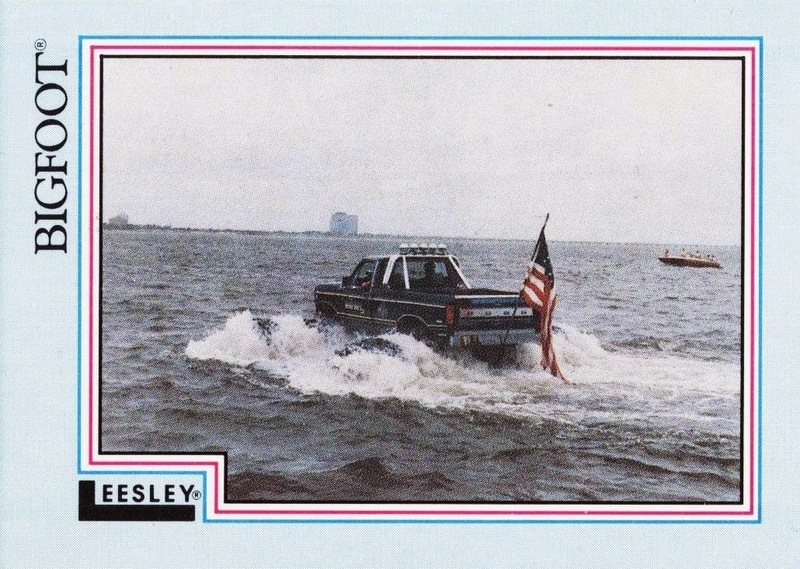 And finally...a baseball card. Yes, really! I am not a baseball collector. I don't hate it by any means, but I don't love it either. 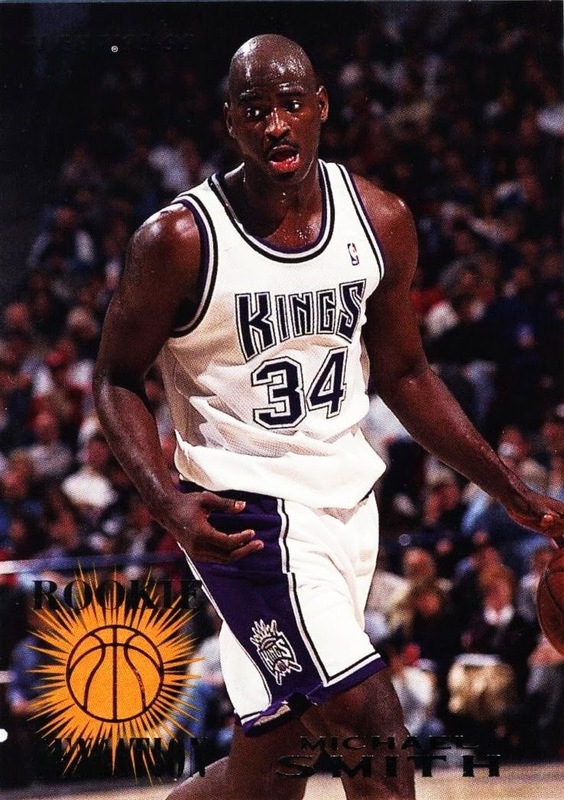 (I will say it's the only sport that they actually get the cards RIGHT, though) Back in the day, I would have been very disappointed to pull a card that wasn't basketball from one of these packs. Now, though, I am happy to add a new set to my collection. Another one of my many goals is to have as many sets as possible represented in my collection. And it's a checklist, I am a big fan of checklists, so for me this is actually more interesting than a single player card. I have actually added a lot of baseball cards to my collection in 2014. Over 300. I received some as gifts, (I will take any card as a gift- even duplicates or sports/things I don't collect) and I have rescued some that were going to be thrown away. No card should ever be thrown away. 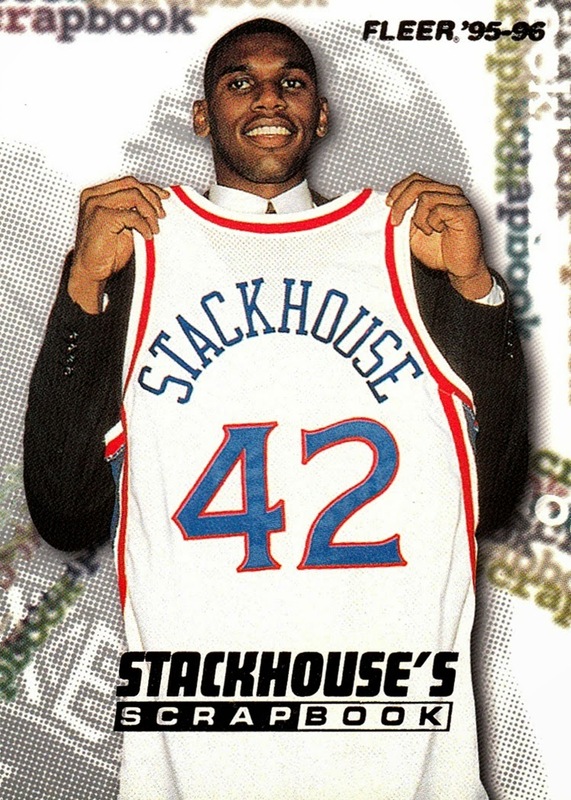 My collection, in 25 years previously collection, was around 50 cards, all of which came to me by being in various mixed boxes of basketball cards. I can't guarantee I will post every new card I get- actually, I can pretty much guarantee I won't post them all- but as my first new additions since the beginning of Cardboard History, I thought it worth a post to show them off. I plan to eventually write up a profile of each and every set in my collection - there are over 1000 sets represented - and what better set to start with than the very first set in my collection? Back in 1988, I was already a collector. I already had a comic collection, and action figures, and mainly- what was my favorite hobby for a long, long time- 1/64 diecast replicas. 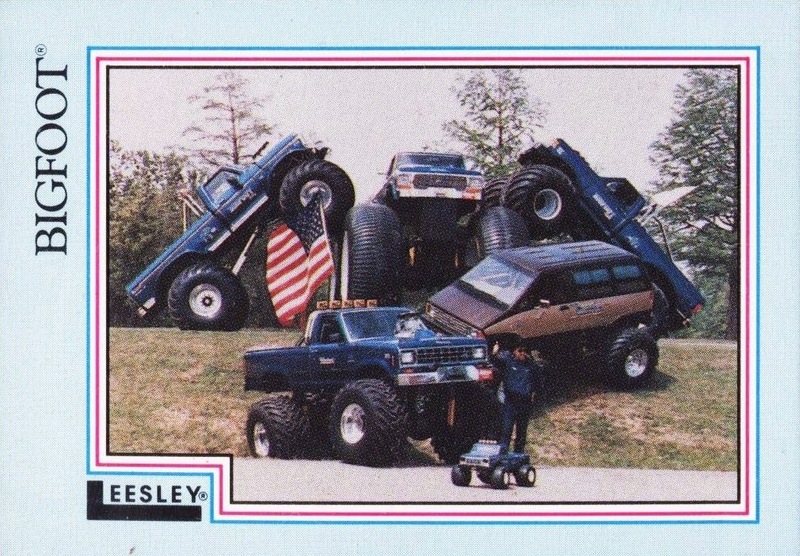 Including lots of monster trucks. 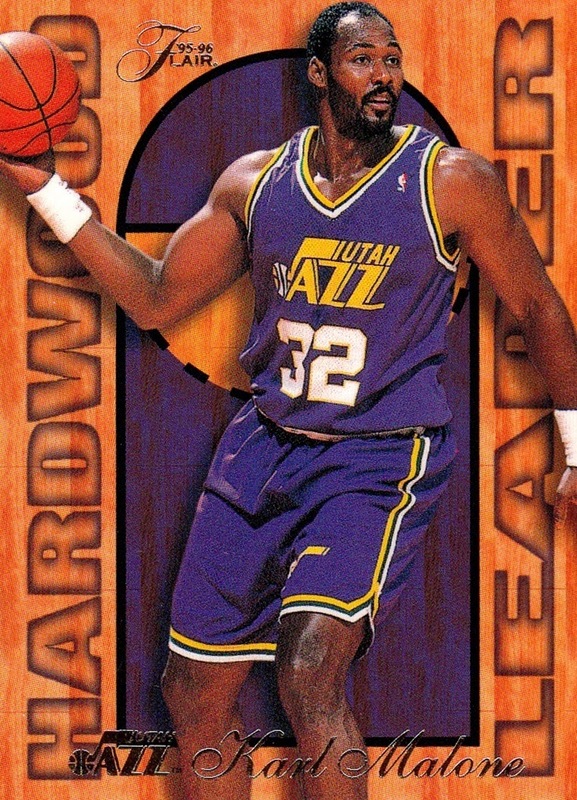 I no longer remember where, or when I got my first cards, but I know it was this set, and I know it was sometime during 1988. For many years, in fact, I did not know this was my first set. I thought that the 1977, 80 and 83 Topps Star Wars/Empire Strikes Back/Return of the Jedi cards my brother gave me (his duplicates that he got when they were new) were my first cards, but he remembered that he only gave them to me after I got the Bigfoot cards. I knew then that this set was #1, not number 4! When they were new, I only got about 25 of the cards. In April 2013, I bought a box on Ebay, but opening it was somewhat frustrating. There were many duplicates, usually the same cards in the same order, but I am still 10 cards short of the set, having 90 of the 100. The box also arrived just a few days before I nearly died and I didn't finish opening them for some time because of that. 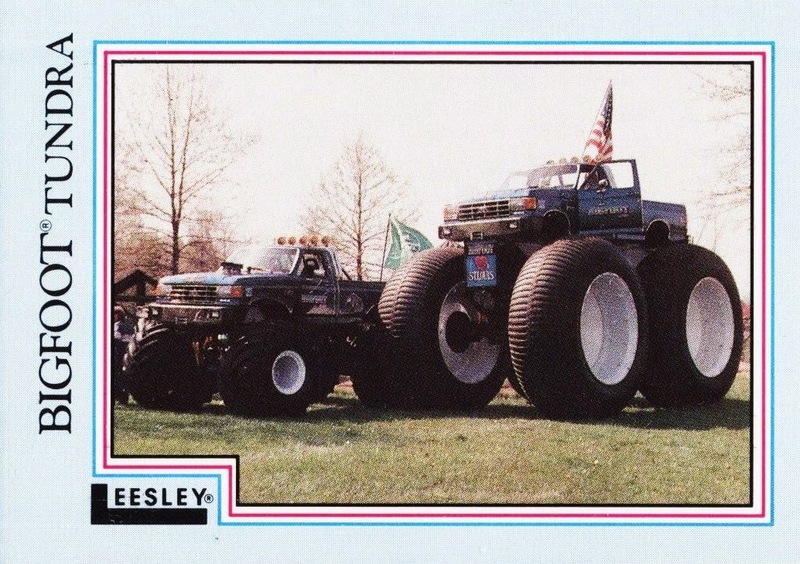 It was the first monster truck set issued, and only three more have come after it. 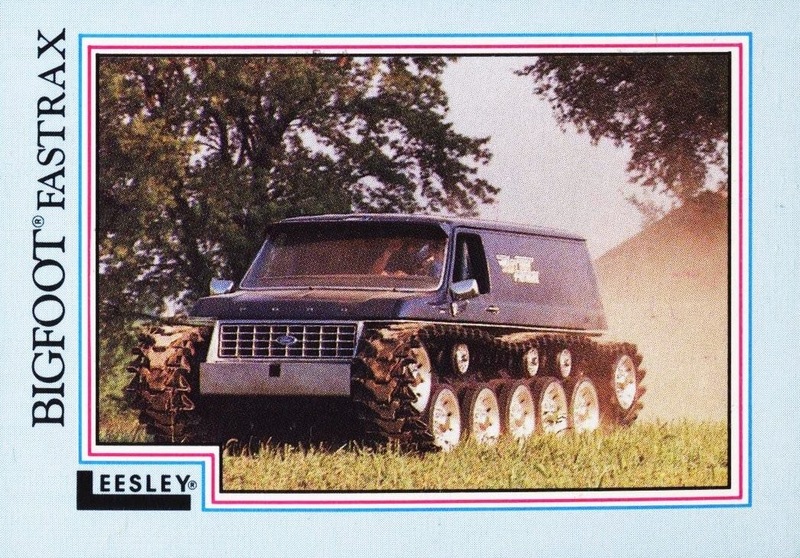 Leesley issued another set, but I don't know the year, and I've been unable to hunt any down. It was right around the same time frame- I have heard that it may have been issued in 1989 or 90. All I know is that it includes other trucks and has a gray border. 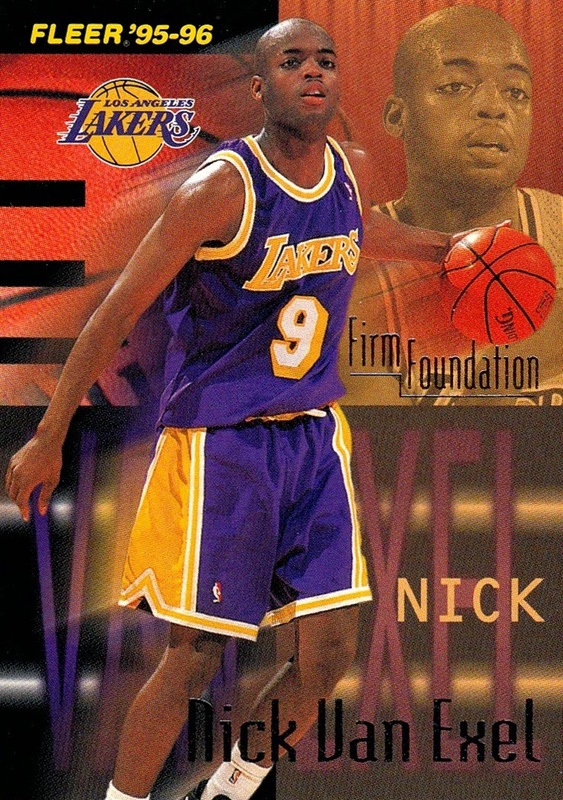 I will post a Set Profile of the 1990 Classic release soon, it was the first set I ever completed. 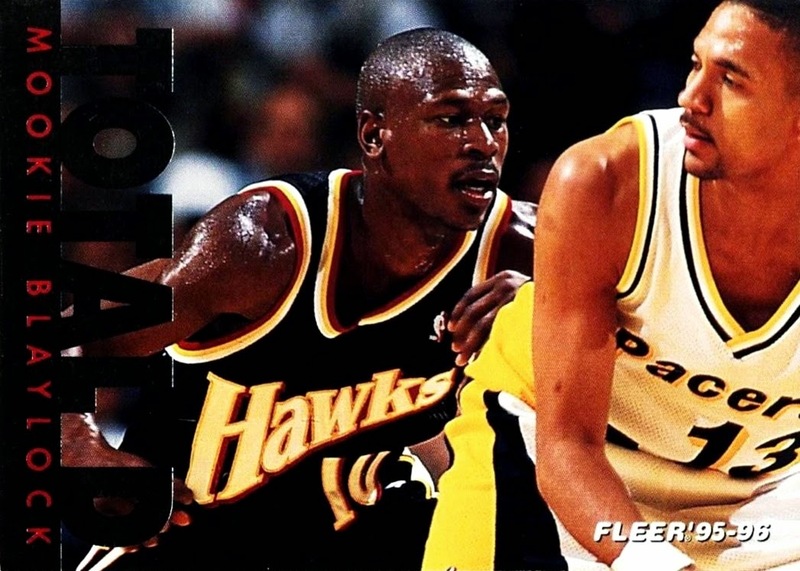 The 4th and as of now final set was issued by Topps in 2012, and was only available with the Hot Wheels replicas, which I generally no longer collect, but I did purchase a few of the 1990s trucks they did as throwbacks, like the Michigan Ice Monster. 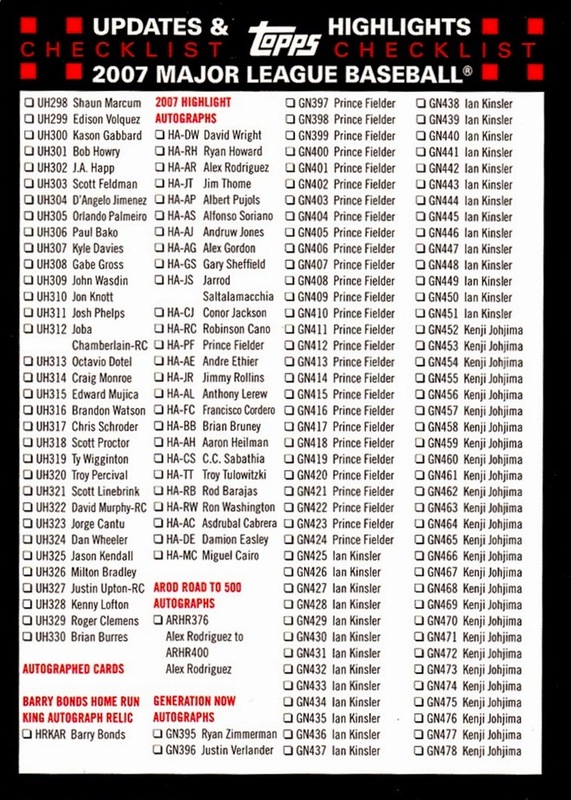 To view full scans, front and back of 89 of the cards, and to track your own collection, here is it's page on the Database. You can also see which ones are on my wantlist as well. 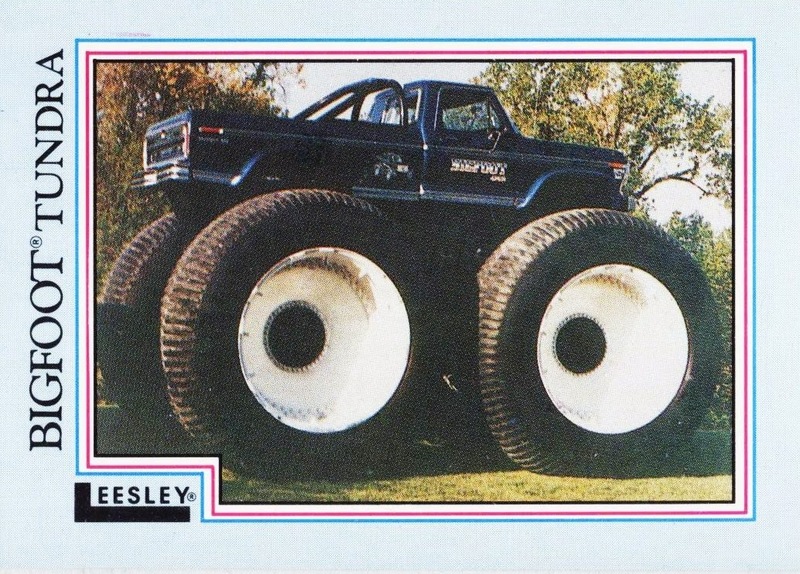 1988 Leesley Bigfoot on The Trading Card Database Below are 10 cards that illustrate the set. Mud bogging! 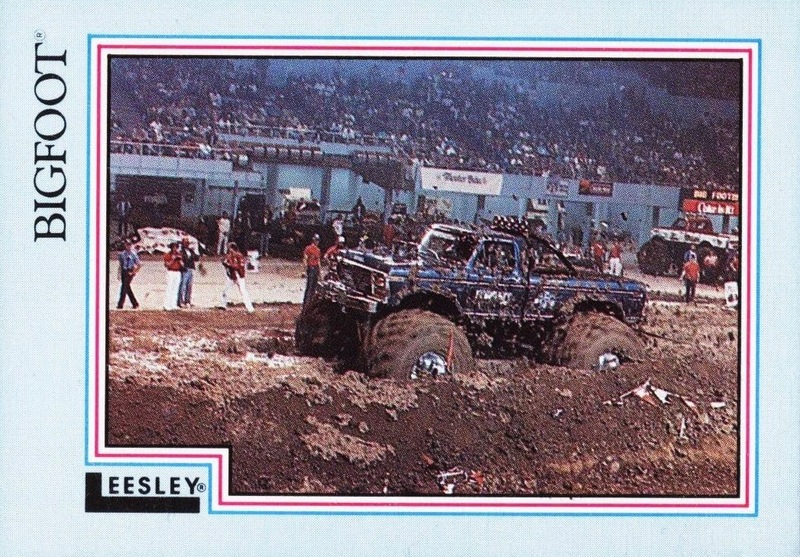 I love mud bogging, and it used to be a mainstay of monster truck competition in the 1980s and early 90s. 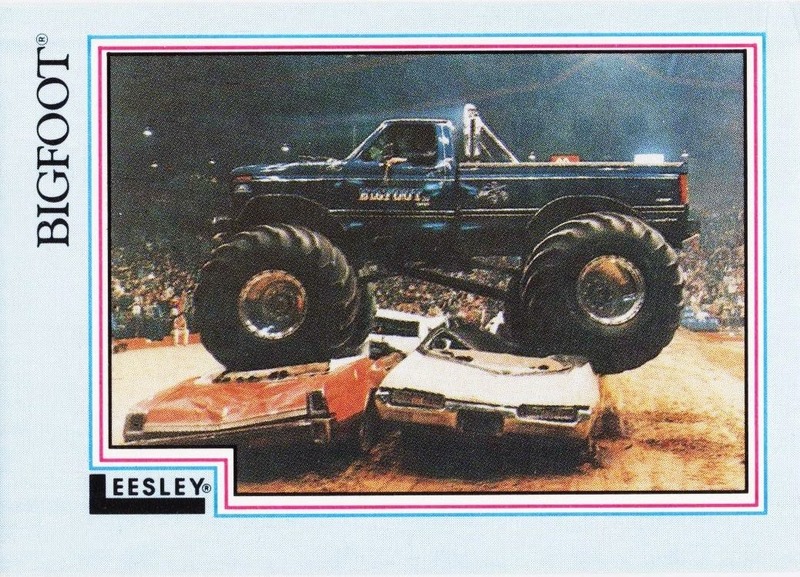 Back in the day, monster trucks used to be about doing stunts...now it's about destruction and nothing more, no longer do they do stunts like this. The large tires allow the trucks to float. Here Bigfoot 3 crosses Lake Pontchartrain. Bigfoot Tundra. A legendary truck. 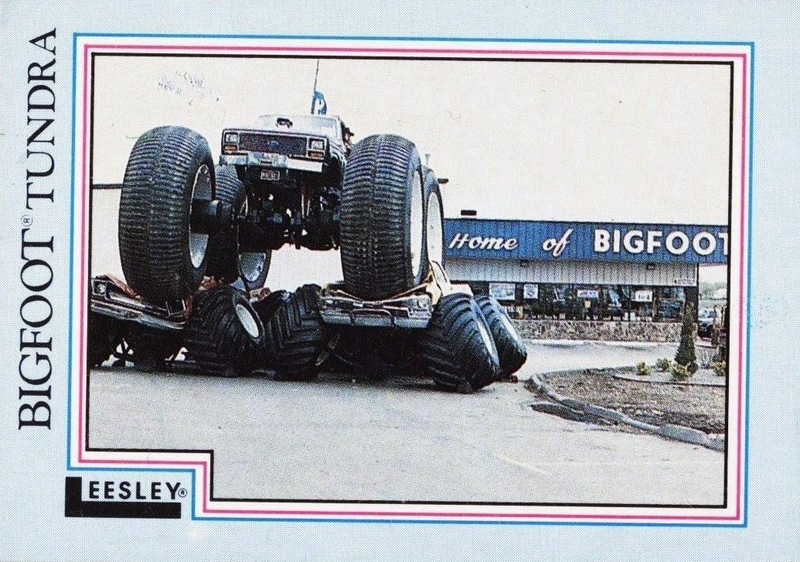 Those gigantic wheels and tires really made it stand above the rest- literally! 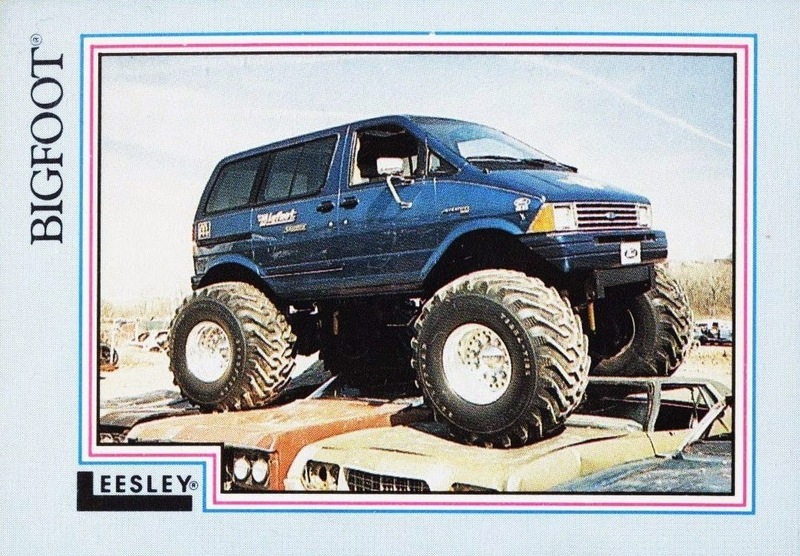 Bigfoot Fastrax combined a Ford cargo van with a tank. Because that's what they did in the 1980s. It didn't really take off, and there are only a few tank trucks left in operation today. 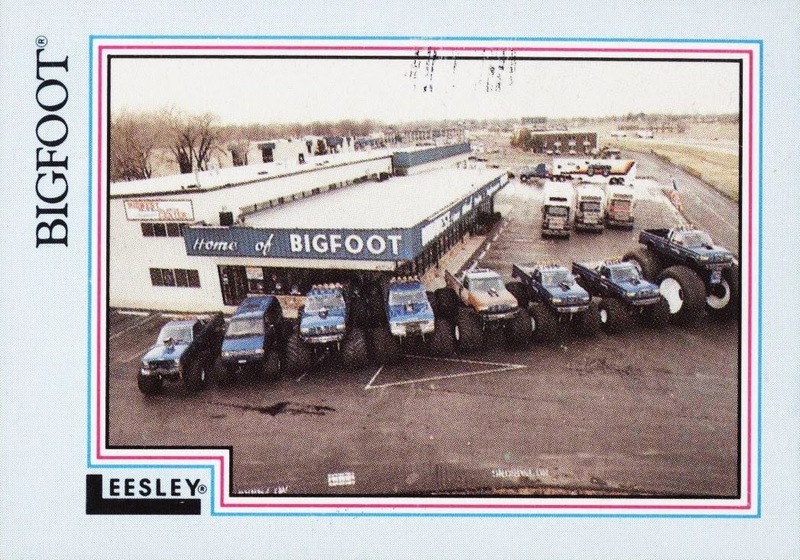 By 1988 the Bigfoot family had many trucks already. They are still in operation today and have built dozens of trucks. Unfortunately not all of these trucks survive. A great Bigfoot family portrait. I'll be honest- I hate the so-called "super premium" sets...the ones that cost an arm, leg and kidney to buy...and I've mostly stayed away from them. Not by choice, but because medicine must come before cards. Each box of Press Pass Showcase sells for roughly $225, so, in all the years they've done it, I've never done a box before. Until November 17th, 2014. Dave & Adam's put the box on sale for $100. For 16 cards, that's still a lot of money...but I could justify spending that. 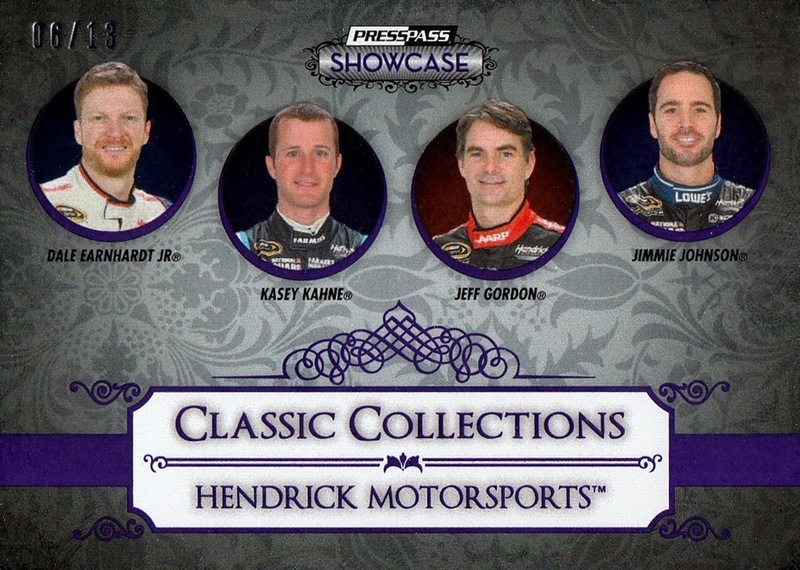 And besides, I may never have another chance to do a box of Showcase, so why not? Now, in a normal box break, I would not post every card. 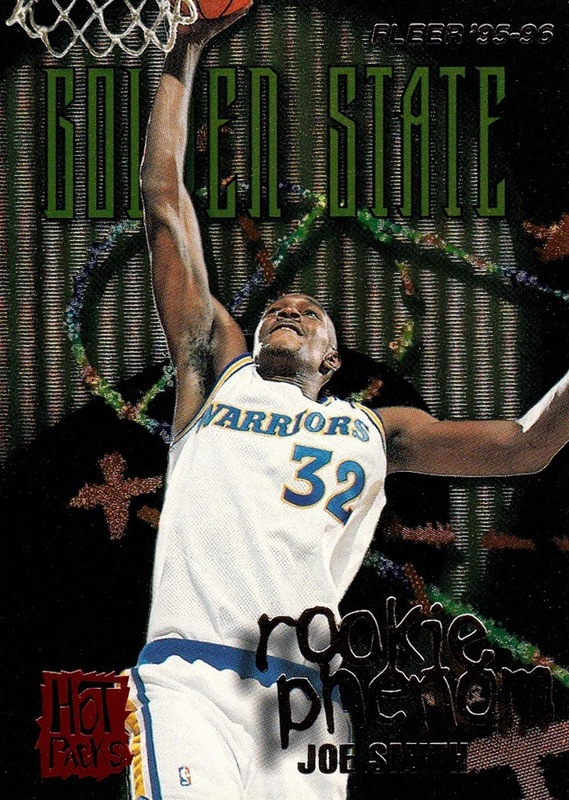 For instance, I did a box of 2014-15 Hoops a few weeks back and ended up getting several hundred new cards- to see them all, that's what the Trading Card Database is for. I would post highlights- the standard hits, and whatever I deem as highlights. 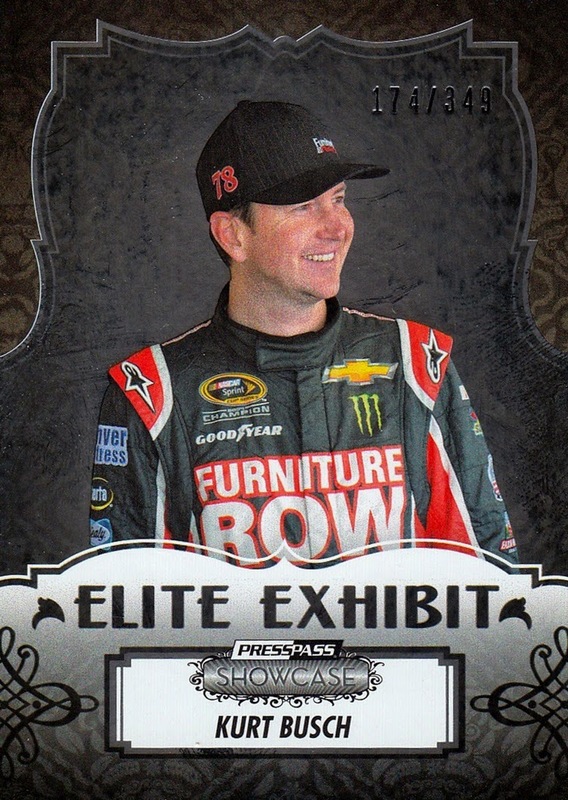 But at 16 cards, for Showcase, I will attempt to post them all. 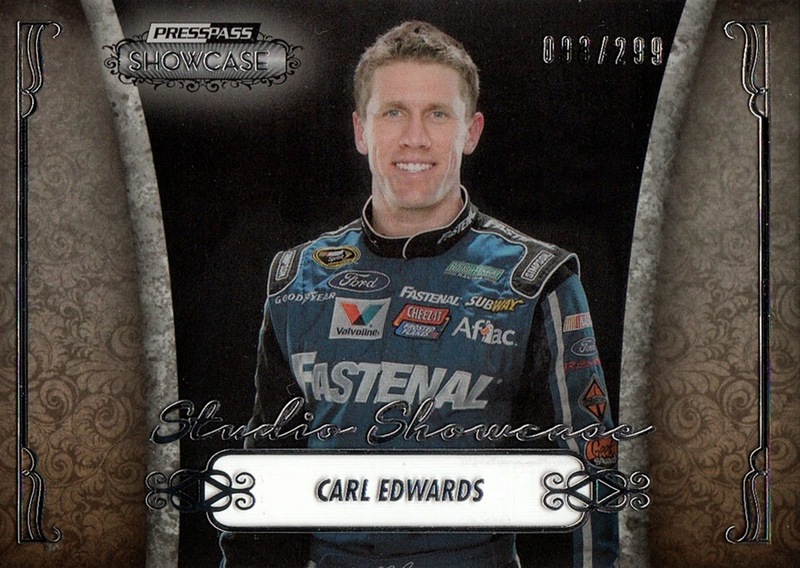 The first card out of the box is a Carl Edwards insert, which is actually printed on clear plastic. Serially numbered 093/299. Second card out turns out to be my favorite of the entire box! 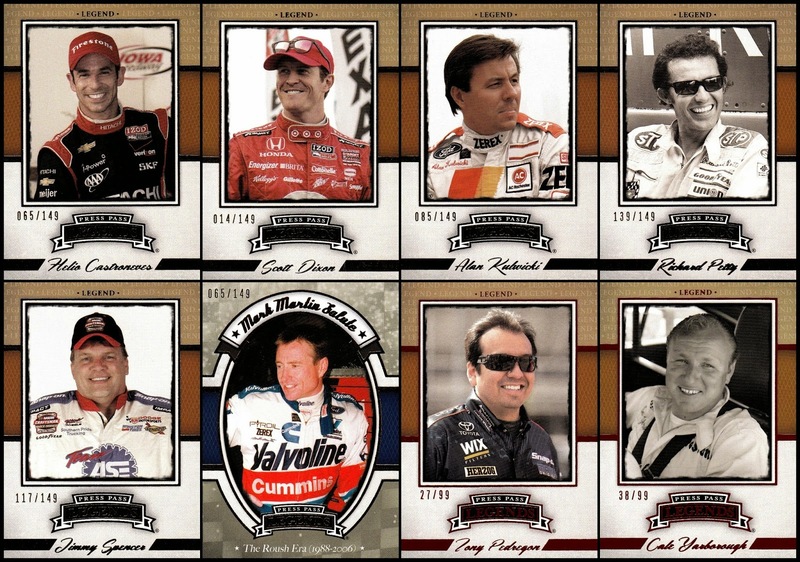 Dale Earnhardt Jr. has been my driver since Ernie Irvan retired and Dale moved to Cup in the same year. I have never had a lot of luck pulling multi-piece relics but I pulled a good one here. 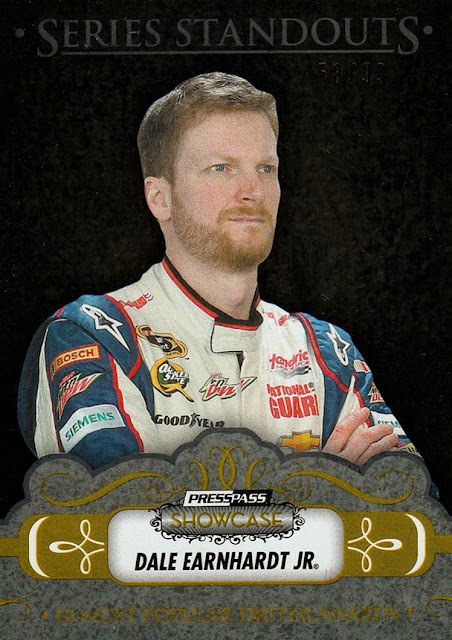 This is the second piece of sheet metal I've pulled from Dale Jr, the last coming all the way back in 2002. 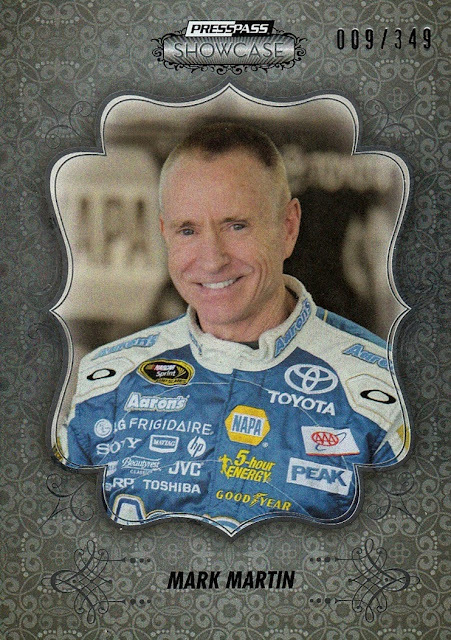 First base card, #19 Mark Martin. Good design. Mark has been around since they raced chariots...not really but it sure seemed like it at the end. 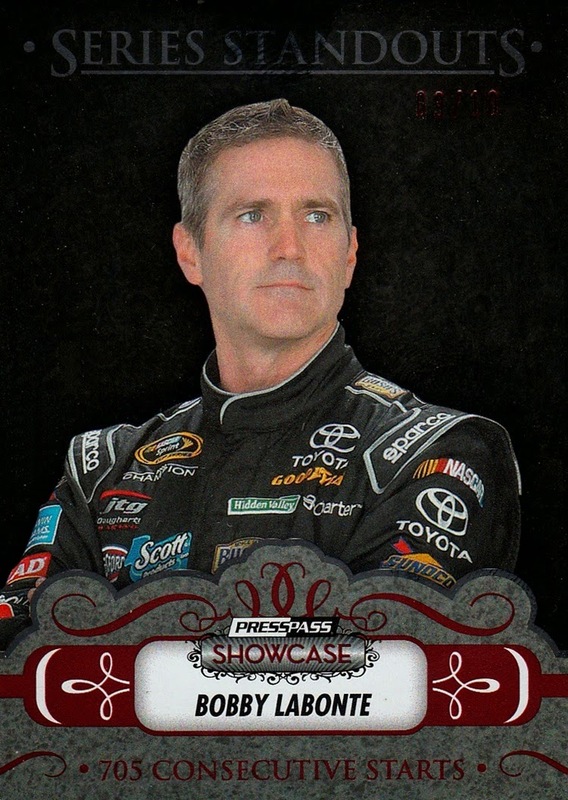 Odd twist of fate- my only other previous Showcase base card, which I was given as a gift, is of Mark, from the 2010 set. 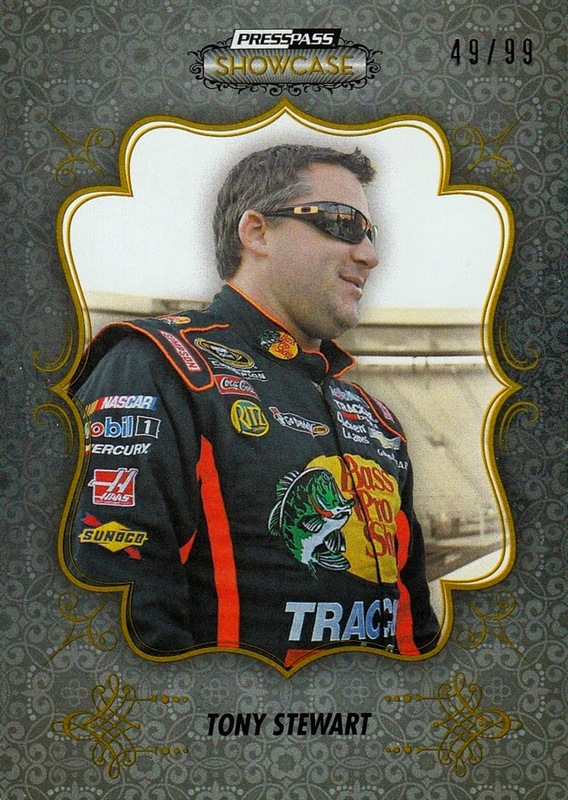 The next card is a subset of Tony Stewart. 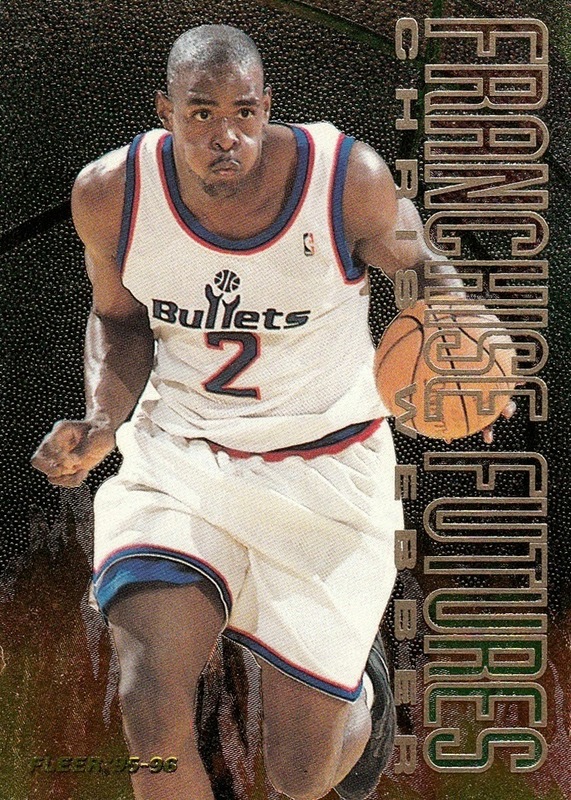 I like the base card design better...what a shocker! The serially numbering, which didn't scan all that well, is 170/349. The final card in pack #1, is a gold parallel of Dale Earnhardt Jr. The subset looks better with the gold bracing. The serial number is 58/99. 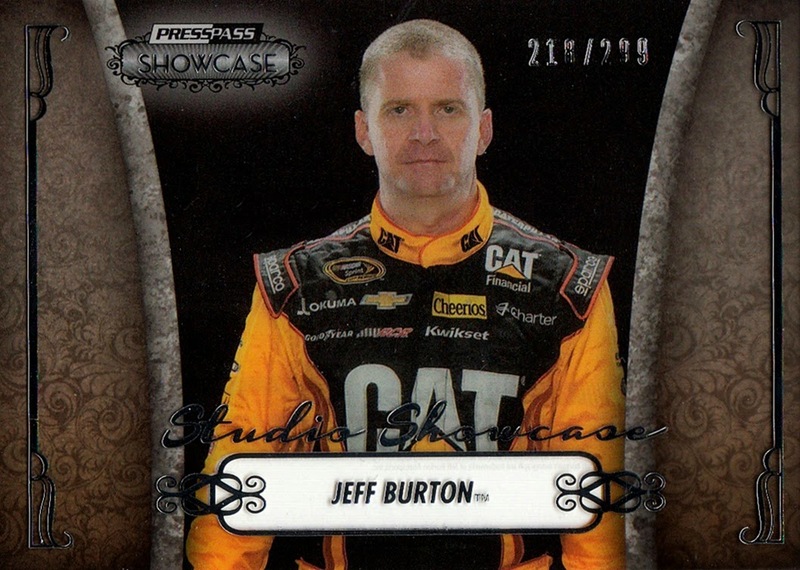 The second pack starts out with another clear card, of Jeff Burton. 218/299. 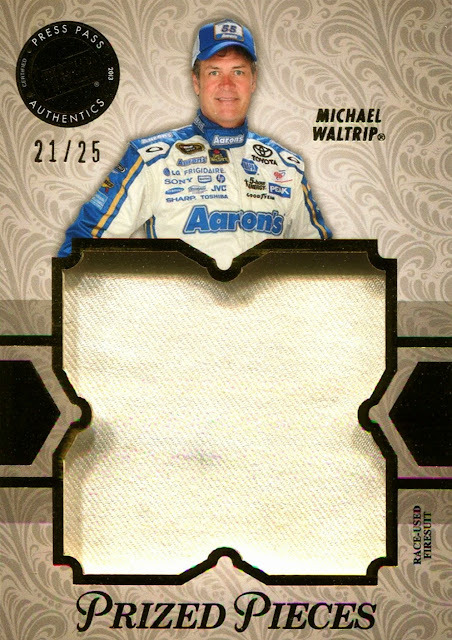 The second card out is a firesuit of Michael Waltrip. And what a big piece of firesuit it is! In fact, I think this may be the largest relic in my collection. Second largest for sure. As I was typing up the insert checklists to post to the Database, I realized this was actually a gold parallel of the basic Prized Pieces insert. The gold foil and being numbered to 25 tell you that fact. 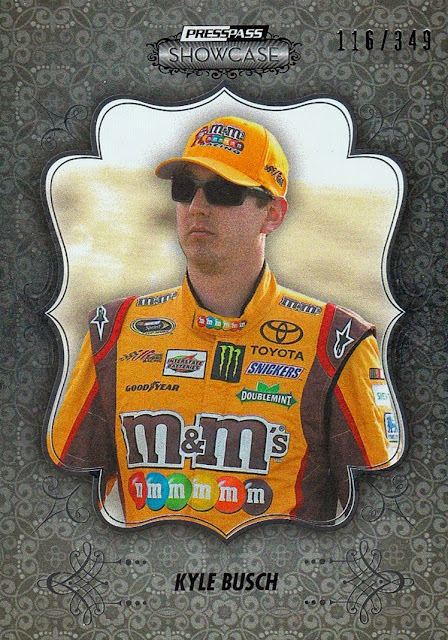 The base card for this pack is Kyle Busch. Not my favorite, but also not my least-favorite driver in the set, either. SN116/349. 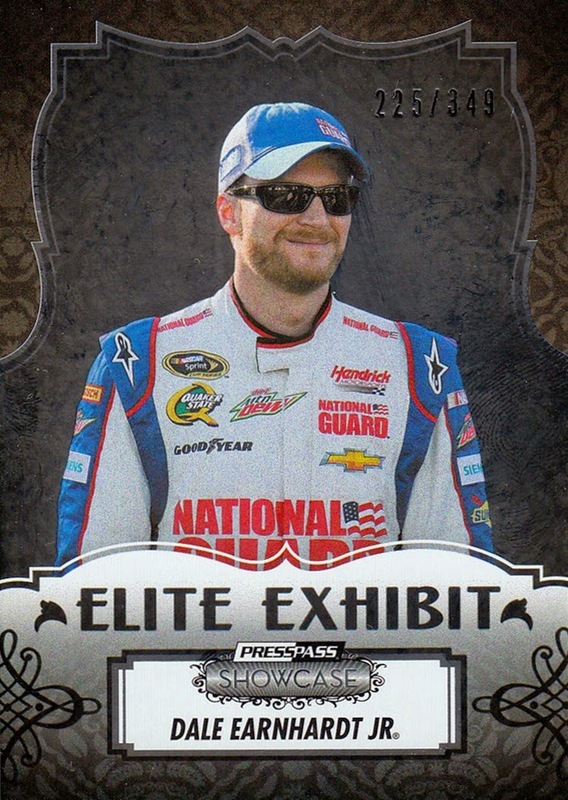 Another Dale Jr. card, can't complain about that! 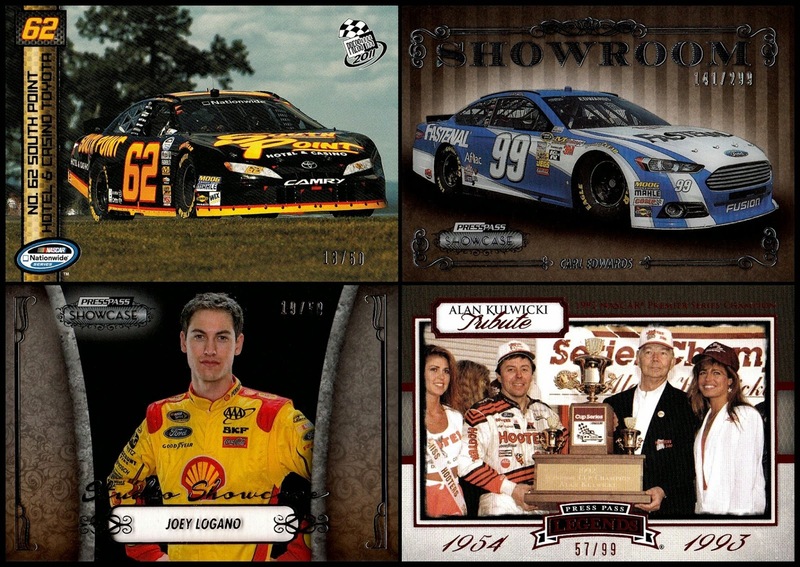 This is a different subset, but neither of them are really worthwhile, cards of the cars would have been much better. 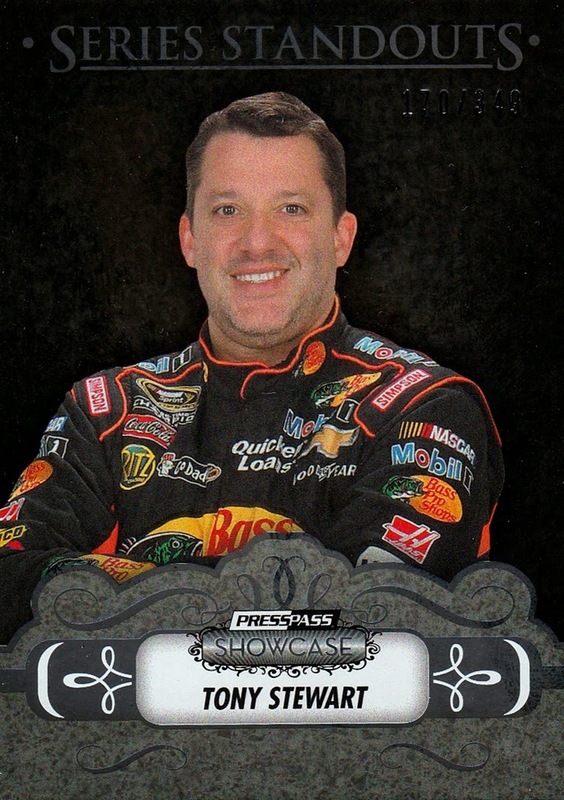 Parallel for this pack is Tony Stewart's base card. The final full pack. I knew there was going to be an autograph in this one, or so I thought. Finally, a car shot! Also printed on clear plastic, this is serially numbered 279/299. They even managed to get a special paint scheme. 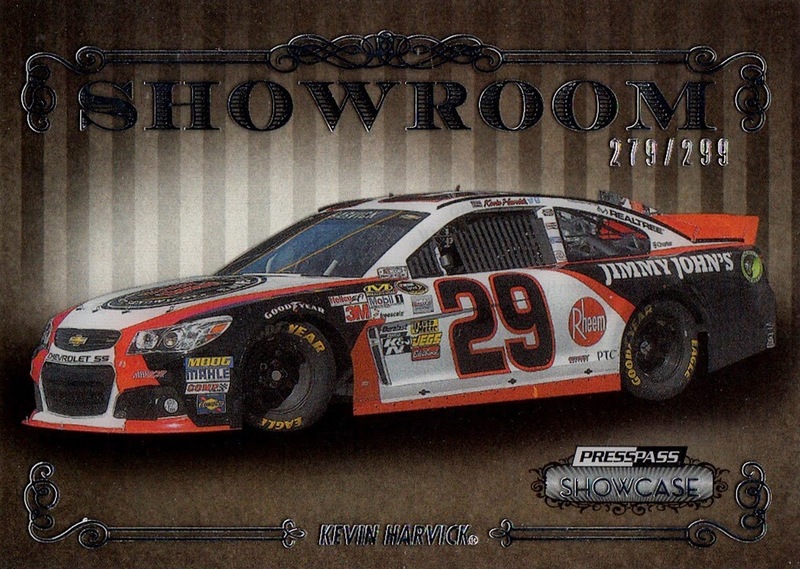 I'm glad they went with the Jimmy John's car instead of a fake censored Budweiser car, as well. I know it's not Press Pass's fault, but I loath the goofy fake junk they have to put on the cars instead of the real sponsor. Now, what should be the autograph. But it's not. I got a redemption. I loathe redemptions- I have terrible luck with them. 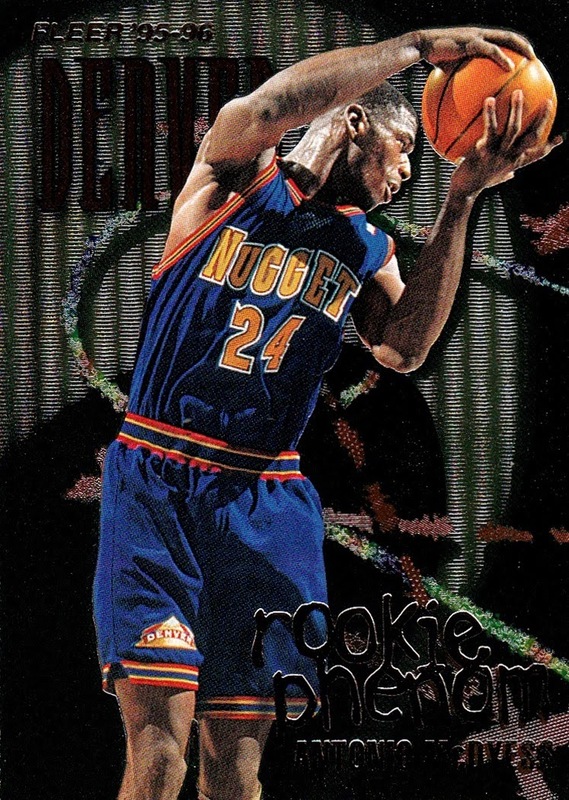 I am still owed cards from both Fleer and Upper Deck, (I know I will never get them) but the worst thing is I usually get the redemption cards after they have expired- I once pulled one from a Topps NBA set literally the day after it expired. 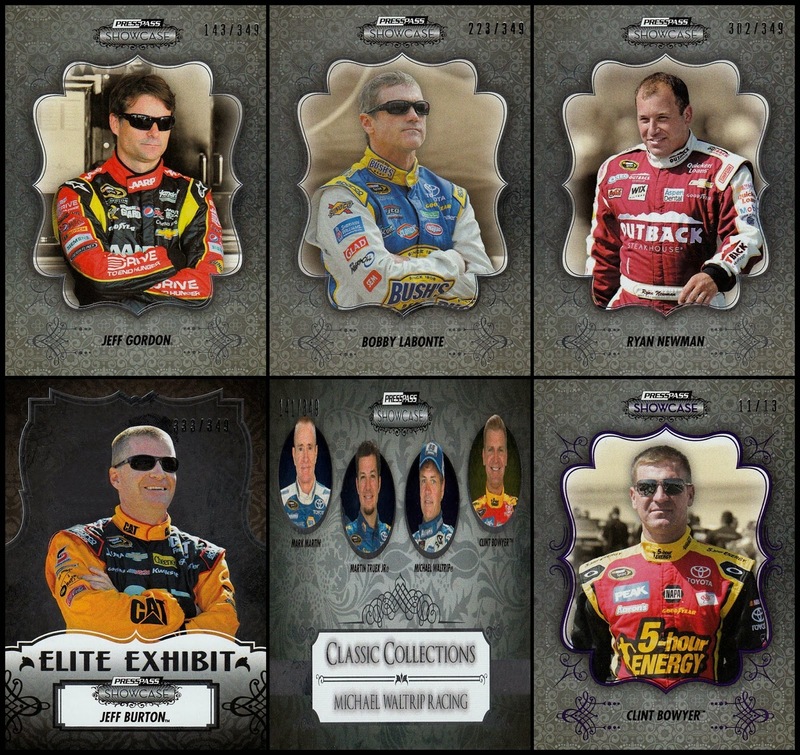 If I ever own a card company (a lifelong dream) there will be no redemptions whatsoever- all cards will be inserted into packs. 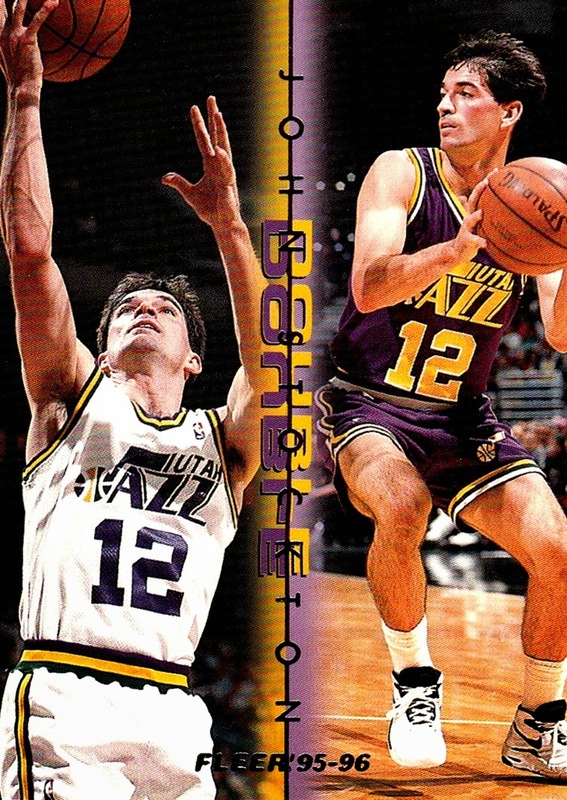 I'll post what the autograph is when it arrives from Press Pass- I need to hold out for a mailday post. I don't have a lot of mail days anymore. Card #3 is a Joey Logano base card. SN081/349. 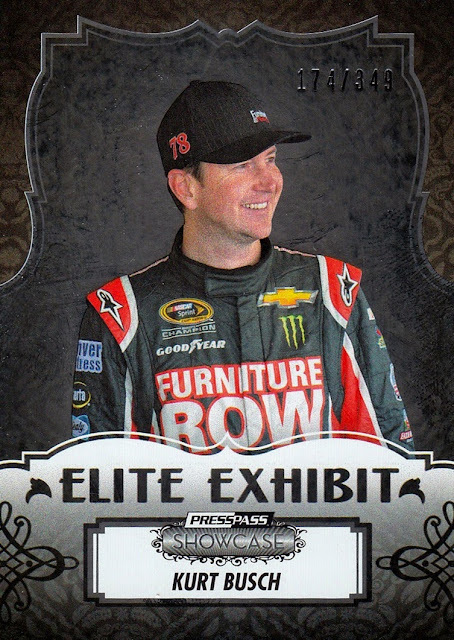 Another Elite Exhibit subset, this time of Kurt Busch. It's numbered 174/349. 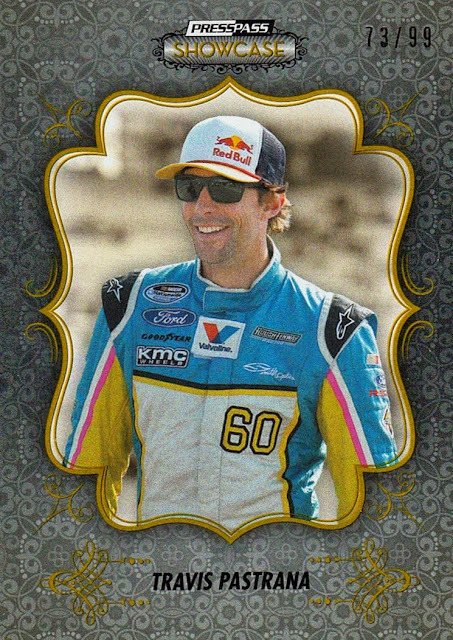 The gold parallel for this pack is of Travis Pastrana. I was surprised to see he was included in the set, and he's already out of NASCAR- the money ran dry. It's SN73/99. As it turns out, I got the rarest parallel of all, the Purple set, serially numbered to 13. This card, #55 in the 60 card set, is SN 06/13. Overall, I am very happy with my box. It was definitely worth the $100, but had I spent $225 I would have felt ripped off. I was very unhappy when I did the box, not knowing for sure if the autograph would ever actually appear in my collection, but I am now fairly sure it will. It's of a driver I've always wanted, so I am looking forward to getting it.